In January 1848, James Wilson Marshall discovered gold while constructing a saw mill along the American River northeast of present-day Sacramento. The discovery was reported in the San Francisco newspapers in March but caused little stir as most did not believe the account. The spark that ignited the gold rush occurred in May 1848 when Sam Brannan, a storekeeper in Sutter's Creek, brandished a bottle filled with gold dust around San Francisco shouting 'Gold! Gold! Gold from American River!' The residents of the city now had proof of the discovery and the stampede to the gold fields was on. San Francisco's harbor was soon cluttered with derelict ships deserted by their crews. Workers abandoned their jobs - San Francisco's two newspapers were forced to close their doors as their staffs were struck by gold fever. The populations of many of the coastal towns were depleted as prospective prospectors headed to the gold fields. The New York Herald printed news of the discovery in August 1848 and the rush for gold accelerated into a stampede. Gold seekers traveled overland across the mountains to California (30,000 assembled at launch points along the plains in the spring of 1849) or took the round-about sea routes: either to Panama or around Cape Horn and then up the Pacific coast to San Francisco. A census of San Francisco (then called Yerba Buena) in April 1847 reported the town consisted of 79 buildings including shanties, frames houses and adobes. By December 1849 the population had mushroomed to an estimated 100,000. The massive influx of fortune seekers Americanized the once Mexican province and assured its inclusion as a state in the union. 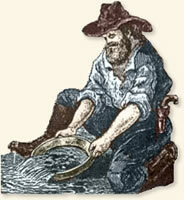 S. Shufelt was one of those gold-seekers. All that we know about Mr. Shufelt is contained in a letter he wrote from the gold fields to his cousin in March 1850. We don't know if he struck it rich or whether he ever returned to his wife and home - we don't even know his first name. On May 11, 1849 he boarded the steamer Panama in New York City along with about 200 fellow fortune hunters risking all on a gamble in California. Behind him he left a wife and child in Windham, NY near the Catskills. Mr. Shufelt reveals his motivation when he tells his cousin that: "I have left those that I love as my own life behind and risked everything and endured many hardships to get here. I want to make enough to live easier and do some good with, before I return." These same thoughts no doubt inspired the majority of those who made the trek to the gold fields - they were not intending to stay, but planned to make some money and return to their origins. Mr. Shufelt's letter was discovered at an auction in 1924 and is now part of the collection of the Library of Congress. "(We) proceeded up the river in canoes rowed by the natives, and enjoyed the scenery & howling of the monkeys & chattering of Parrots very much. We pitched our tents at Gorgona & most of our party stayed there several weeks. S. Miller & myself went on to Panama to look out for a chance to get up to San Francisco. Of our ill success you have probably been informed & consequently of our long stay there, & of the deaths in our party. Yes, here Mr. Crooker, J. Miller & L. Alden yielded up their breath to God who gave it. After many delays & vexations, we at length took passage on a German ship & set sail again on our journey to the Eldorado of the west. We went south nearly to the Equator, then turned west, the weather was warm, the winds light & contrary for our course. Our ship was a slow sailer & consequently our passage was long & tedious. One of the sailors fell from the rigging into the water & it was known that he could not swim, so the excitement was great. Ropes, planks and every thing that could be got hold of was thrown to him. He caught a plank & got on it, a boat was lowered & soon they had him on board again. He was much frightened, but not much hurt. We had one heavy squall of wind & rain, that tore the sails & broke some of the yards in pieces, & gave us a quick step motion to keep upon our feet, but soon all was right again & we were ploughing through the gentle Pacific at the rate of ten knots pr hour. On the 85th day out we hove in sight of an object that greatly attracted our attention & ere long the green hills of San Francisco bay began to show their highest points, & soon we were gliding smoothly along between them, down the bay, & when the order came to let go anchor, we brought up directly in front of the City amidst a fleet of vessels, of all kinds & sizes." "We took passage on a small schooner, crossed the bay with a gentle breeze & soon were winding our way up the crooked Sacramento. We soon entered Soosoon bay & our Capt. not being acquainted with the channel we ran on the ground at high tide & a stiff breeze, so that we were fast in reality. As the tide fell our little schooner fell also on her side & filled with water. We clung to the upper side, but were so thick that as night drew on the Capt. thought some of us had better go on shore. Some of our party went, myself among the rest. We came very near getting swamped on the water. We laid our frail bodies down to rest, & after a short nap the watch waked us with the sad news that the tide was rising fast & would soon overflow our resting place. Some found their feet asoak, others their blankets, & all jumped up exclaiming what shall we do, but we managed to keep out of the water by getting on old logs & bogs until morning, which being Sunday & being obliged to stay there all day made it one of the most unpleasant Sabbaths that I ever spent. At night the Capt. sent a boat and took us on board & at high tide at midnight we succeeded in getting off & after spending one week & getting fast several times more we at length reached Sacramento City to the joy of our hearts & the relief of our hands." "We hired an ox team to carry our baggage & started for this place then called Hangtown, from the fact that three persons had been hung here for stealing & attempting to murder. Ten miles from the river we passed Sutters fort, an old looking heap of buildings surrounded by an high wall of unburnt brick, & situated in the midst of a pleasant fertile plain, covered with grass and a few scattering oaks, with numerous tame cattle & mules. We walked by the wagon & at night cooked our suppers, rolled our blankets around us & lay down to rest on the ground, with nothing but the broad canopy of the heavens over us & slept soundly without fear or molestation. After leaving the plains we passed over some hills that looked dry & barren being burnt up by the sun & the long droughts that we have here. We reached this place at night on the fourth day, & in the morning found ourselves in the midst of the diggings, being surrounded by holes dug. We pitched our tents, shouldered our picks & shovels & with pan in hand sallied forth to try our fortunes at gold digging. We did not have very good success being green at mining, but by practice & observation we soon improved some, & found a little of the shining metal. " "It is found along the banks of the streams & in the beds of the same, & in almost every little ravine putting into the streams. And often from 10 to 50 ft. from the beds up the bank. We sometimes have to dig several feet deep before we find any, in other places all the dirt & clay will pay to wash, but generally the clay pays best. If there is no clay, then it is found down on the rock. All the lumps are found on the rock--& most of the fine gold. We tell when it will pay by trying the dirt with a pan. This is called prospecting here. If it will pay from six to 12 1/2 pr pan full, then we go to work. Some wash with cradles some with what is called a tom & various other fixings. But I like the tom best of any thing that I have seen. It is a box or trough about 8 or 9 feet long, some 18 in. wide & from 5 to 6 in. high, with an iron sieve in one end punched with 1/2 in. holes. Underneath this is placed a ripple or box with two ripples across it. The tom is then placed in an oblique position, the water is brought on by means of a hose. The dirt, stone, clay & all is then thrown in & stirred with a shovel until the water runs clear, the gold & finer gravel goes through the sieve & falls in the under box & lodges above the ripples. Three men can wash all day without taking this out as the water washes the loose gravel over and all the gold settles to the bottom. One man will wash as fast as two can pick & shovel it in, or as fast as three rockers or cradles." Life in Camp: "There is a good deal of sin and wickedness going on here"
"Many, very many, that come here meet with bad success & thousands will leave their bones here. Others will lose their health, contract diseases that they will carry to their graves with them. Some will have to beg their way home, & probably one half that come here will never make enough to carry them back. But this does not alter the fact about the gold being plenty here, but shows what a poor frail being man is, how liable to disappointments, disease & death. There is a good deal of sin & wickedness going on here, Stealing, lying, Swearing, Drinking, Gambling & murdering. There is a great deal of gambling carried on here. Almost every public House is a place for Gambling, & this appears to be the greatest evil that prevails here. Men make & lose thousands in a night, & frequently small boys will go up & bet $5 or 10 (Equivalent to $115-$225 today) -- & if they lose all, go the next day & dig more. We are trying to get laws here to regulate things but it will be very difficult to get them executed." Mr. Shufelt's letter is part of the collection of the Library of Congress A letter from a gold miner, Placerville, California, March, 1850; Holliday, J.S. Rush for Riches: Gold Fever and the Making of California (1999). "The California Gold Rush, 1849" EyeWitness to History, www.eyewitnesstohistory.com (2003). Since publishing this eyewitness account we have heard from a descendant of Mr. Shufelt who provided some additional information. His first name was Sheldon and he was born in 1818. He married his wife Margaret in 1844 and they had a son in 1847. Returning home from the goldfields, Sheldon was captured by Spanish bandits while crossing the Panama isthmus. He was confined and held for ransom. He managed to escape and make his way home but he had contracted a tropical disease from which he died in 1852 at age 34. His wife, Margaret, died in 1861 at age 42. James Marshall - the original discoverer of gold - died on his claim in the gold fields in 1885 without even enough money to pay for his burial. California's Gold Rush lasted until 1851.